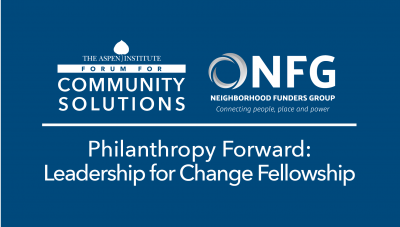 The Forum for Community Solutions and the Neighborhood Funders Group are excited to launch the second year of the Philanthropy Forward: Leadership for Change Fellowship for CEOs of progressive philanthropic institutions. This second cohort will add to the original 16 cohort members from the first year, an annually growing network of visionary CEO leaders who share a belief in a model of community partnership that centers community knowledge and power building. Together, Fellows will be strategic thought partners, with a dedicated space to organize together, boldly envisioning and advancing the transformed future of philanthropy. A future that centers and achieves equity and social justice. Philanthropy Forward Fellows will be unlocking the challenges to philanthropy and realizing its fullest role as a collective financial engine for social change. For questions, please contact Sheri Brady at: sheri.brady@aspeninstitute.org. Outcomes will be at the individual leadership, organizational, and philanthropic field levels. An important component will be building relationships with other foundation CEOs from across the country within the 9-month program. Fellows will be a part of the Fellow Alumni community and will have opportunities to engage with Fellows of previous and future cohorts. Ultimately, the intention is to emerge with a collective identity as a financial engine for social change focusing on community centered strategies, centering long term impacts, and advancing justice, equity and power. 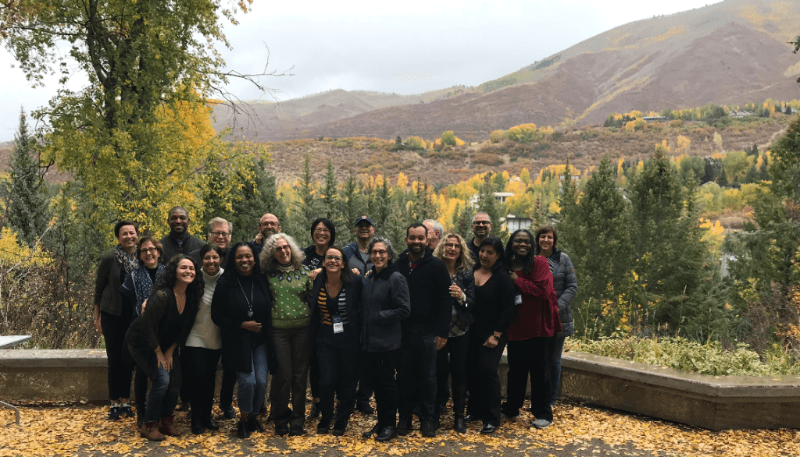 Philanthropy Forward’s second cohort will include three 2.5-day retreats during the weeks of September 23rd, 2019, January 27th, 2020, and our closing retreat in Aspen Colorado the week of May 10th, 2020 (exact days are still to be determined). After the kick-off, cohort members receive a 360-degree leadership assessment on equity and power in grantmaking. Virtual time to check in on experiments. Estimated time commitment is 12 days over 9 months of Fellowship programming from September 2019 through May 2020, followed by light evaluation activities in July and August 2020. This includes three in-person meetings plus some additional time in virtual sessions for content and strategy learning, peer coaching, and innovation research and experimentation (the innovation work will be scoped by each fellow to be engaging and and realistic to complete). Registration fee is $10,000 per Fellow. Here is a two-pager with all of this information.